Stoddard solvent is a clear liquid chemical that is derived from petroleum. It has the smell of kerosene and is also highly-flammable. Stoddard Solvent Poisoning is the accidental or intentional intake of products containing Stoddard solvent. What is Stoddard Solvent Poisoning? What are the Causes of Stoddard Solvent Poisoning? What are the Signs and Symptoms of Stoddard Solvent Poisoning? How is First Aid administered for Stoddard Solvent Poisoning? Who should administer First Aid for Stoddard Solvent Poisoning? 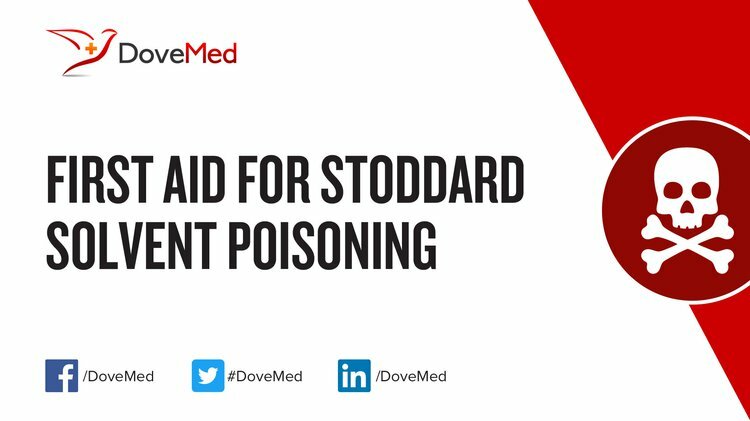 First aid for Stoddard Solvent Poisoning is administered by healthcare professionals. What is the Prognosis of Stoddard Solvent Poisoning? How can Stoddard Solvent Poisoning be Prevented? Desrosiers, T. A., Lawson, C. C., Meyer, R. E., Richardson, D. B., Daniels, J. L., Waters, M. A., ... & Olshan, A. (2012). Maternal occupational exposure to organic solvents during early pregnancy and risks of neural tube defects and orofacial clefts. Occup Environ Med, oemed-2011. Fuente, A., McPherson, B., & Hickson, L. (2013). Auditory dysfunction associated with solvent exposure. BMC public health, 13(1), 39. Calvert, G. M., Ruder, A. M., & Petersen, M. R. (2011). Mortality and end-stage renal disease incidence among dry cleaning workers. Occup Environ Med, 68(10), 709-716. Orsi, L., Monnereau, A., Dananche, B., Berthou, C., Fenaux, P., Marit, G., ... & Hemon, D. (2010). Occupational exposure to organic solvents and lymphoid neoplasms in men: results of a French case-control study. Occupational and environmental medicine, 67(10), 664-672. McPhersonY, B., & Hormazabal, X. (2013). Self-reported hearing performance in workers exposed to solvents. Revista de Saúde Pública, 47(1), 86-93. Lynge, E., Tinnerberg, H., Rylander, L., Romundstad, P., Johansen, K., Lindbohm, M. L., ... & Thorsted, B. L. (2011). Exposure to tetrachloroethylene in dry cleaning shops in the Nordic countries. Annals of occupational hygiene, 55(4), 387-396. Hollins, D. M., Kerger, B. D., Unice, K. M., Knutsen, J. S., Madl, A. K., Sahmel, J. E., & Paustenbach, D. J. (2013). Airborne benzene exposures from cleaning metal surfaces with small volumes of petroleum solvents. International journal of hygiene and environmental health, 216(3), 324-332. Richter, R. O., Kerger, B. D., Hoyt, S., & Fedoruk, M. J. (2013). Total aromatic content in petroleum solvents modifies headspace benzene vapor concentrations: Implications for exposure assessments. Human and Ecological Risk Assessment: An International Journal, 19(2), 354-373.